Published March 21, 2014 By Leisa Good This post may contain affiliate links. Regardless, I only recommend sites I've researched and/or used and trust. Do you have a good command of the English language? Can you work well under tight deadlines and pressure? Are you focused with an eye for detail? Then Babbletype might be the right work-at-home (WAH) company for you. Babbletype is a transcription company that offers the at-home Quality Assurance Associate/Editor or “Q&A Editor” position for its transcription services. While it does hire transcriptionists both in the US and abroad as well as customer service agents, this article will discuss the Q&A Editor position. Most of the transcription at Babbletype is general transcription instead of medical transcription. So, if you must have medical transcription, you might want to look at other companies. Other languages are also offered for transcriptions services, so as the editor you must be aware of how a literal translation may sound once translated to English. You will be given an audio file and the accompanying transcription. Your job will be to compare the two and edit any discrepancies. The Q&A Editor represents the final stage of quality control at Babbletype. reviewing all finished transcripts prior to delivery to the customer. reviewing customer data and notes to ensure a full understanding of detailed project/customer requirements. ensuring that finished transcripts meet those customer requirements. making any and all final corrections needed personally to ensure that the customer perfect product. scoring the work of all prior staff involved in the production of the product via review of changes made. making the final decision as to whether the work is at an acceptable level for delivery to the customer. communicating the history of the project and all relevant information directly to the customer in writing. identifying errors and problems in production processes. 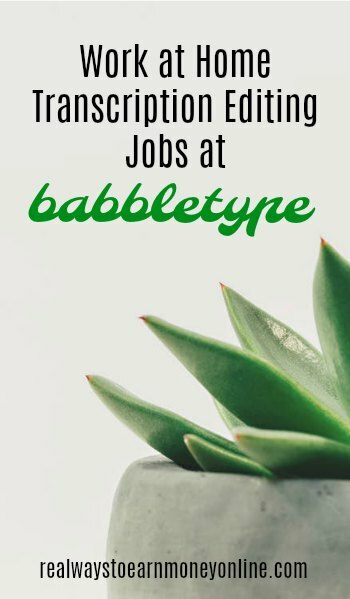 What is the Pay and When is Payday at Babbletype? Work is paid on a unit basis as to how quickly you can edit through an audio hour. The pay averages out to about $10 to $15 a clock hour. With the Q&A Editor position, it is more towards the $15 end. Some will make more, and some will make less. Most workers work about 20 hours a week. The pay is weekly via PayPal. What Are the Requirements of the Remote Q&A Editor at Babbletype? have a bachelor’s degree and several years of experience in proofreading. have an extensive understanding of the rules of English grammar and typography. possess highly effective communication skills. be focused and committed to deliver under pressure. What is Training Like at Babbletype? If you already have a good handle of Express Scribe and Google Docs, then you are already ahead. You will not be paid to transcribe or edit during training. However, some training on the protocols is offered. Are You an Independent Contractor or an Employee at Babbletype? At Babbletype, you are an independent contractor and responsible for your own taxes. If you make over $600 in a given calendar year, you will be sent a 1099 Form. What Are the Hours at Babbletype? Out of the 20 hours, you may log in and do your workload and meet your deadlines with quite a bit of flexibility. What is My Overall Impression of Babbletype? After reading about them online, I think they are a good part-time company if you enjoy transcribing and editing. While you won't make the $30 to $50 an hour like you would in your own transcription business, the pay is weekly and the company seems to receive good markings for fairness, professionalism and management. Mr. John Feldcamp, the CEO, seems to welcome questions and frequents forums to answer them. I also think this would be a good work-at-home job to do while you gained experience and started your own transcription business. How Can an Interested Applicant Apply to Babbletype? Send your resume to recruitment (at) babbletype (dot) com. @Penny – Wow! Sorry your experience was not good. Babbletype is not a scam, but not really worth it if you’re a more experienced transcriber (I wasn’t, so it was okay as far as getting more experience in transcription)…or have any other options for remote work in general. The transcription rates are such where even if you are able to transcribe at the 1:4 industry standard, you’d be making less than minimum wage. Thanks for sharing, Reve. It is always nice when people share their personal experiences. One more thing, they offer “translation” jobs but did not inform me until AFTER the fact that most of the translation material is from the medical field. Now, in my second language I have about 9th-grader proficiency but anybody knows that translating medical terms is entirely another can of worms!!! So I spent 2 hours applying for the job by translating a sample audio, only to find out I was not fit for it. That is the kind of respect they have for your time. Don’t bother. Absolute waste of time unless you are desperate for work and have no other options. Terrible Google Doc setup with a mammoth spreadsheet that is impossible to decode without having watched several hours of youtube tutorials, of course they will not pay you for that time. Then whenever I try to open the sheet to sign up for an assignment, my computer freezes or my phone crashes. I was told that as a newbie I would be in a “trial period” where I can get assignments easily. Not the case, I signed up 4 times and never once did get an assignment. Finally I was given an emergency assignment which was due the same day. Spent 3 hours on it, sent it for review and was told I need to time-stamp all the “inaudible” parts. Fair enough. So I fixed that right away and a week later expecting my $20 but only received $10. I was told the “inaudibles” issue was not fixed “at the time of review.” Whenever that might have been, since I was never given a clear deadline! I’m going to give them the benefit of the doubt and say it’s not a scam, but bad management. Transcription should not be rocket science, yet they bombard you with giant spreadsheets and hours of instructions and documentation, and in the end can’t even assess your work properly. So bottom line, I will dust myself off and be doing something productive with my life, not pandering to these kind of people. They hired me for QA and only gave me transcription work. I’ve never done transcription work, I even attempted a page and was marked fail. After a week of trying to sort out the right credentials I got in trouble for not finishing the work that was given to me. Their set up is very confusing. Google Doc spreadsheet. You are not given as many hours(wpm) as you request not even half. I requested 4 hours and received 1.5. Not a scam, but not what you think you’re signing up for. Thanks for sharing your experience, Bee!